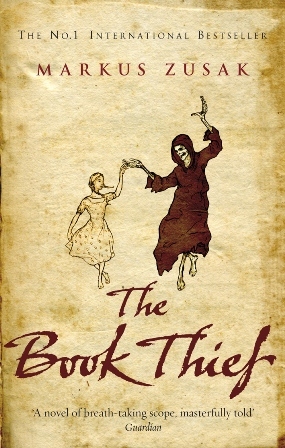 I finally read The Book Thief! Almost two years ago, when B and I first began this blog, The Book Thief by Markus Zusak was on my list of books, the ones I owned but had never read. And it continued to sit there, unread, until, ironically, I bought a copy for my Kindle and read it on that. What can I say? The Kindle is handy for holidays. But anyway, the book itself absolutely and completely lived up to all the good things I had heard about it. For those who don't already know - and honestly, I'd be surprised - The Book Thief is the story of Liesel Meminger, a young German girl living in the shadow of the Nazi Party and World War 2. She first comes to the narrator's attention in 1939, when her younger brother dies as they are travelling by train to Munich and has to be buried by the tracks. Liesel steals her first book - The Gravedigger's Handbook - even though she can't read yet, and so begins a pattern of biblio thievery that lasts the next five years of her life. And the whole thing is narrated by Death. I feel like this is a gambit that could easily have not worked, but in this case it does. The strange framing offered by Death's narration adds a new perspective and feels like a new way to tell a story about ordinary Germans dealing with the privations of the war, their instincts to help their Jewish friends and neighbours, and the need to avoid attracting the punitive attentions of the Nazi regime. It also draws constant, inescapable attention to the fact that, in Germany in this period, Death was everywhere. Literally. The soldiers, the Jews, the German civilians. The body count was immense, and with Death's narration this book is rightfully steeped in it. However, part of the reason it works so well is that Zusak pays attention to Death as a compassionate force. The narration has a particular voice, one that mixes omniscience, bad jokes about its profession, and a huge amount of sympathy for the humans it encounters (by which I mean the dead ones). Death is unable to prevent the terrible things humans do to other humans, but it does its best to be there for all of us in the end. The focus of the story, though, is Liesel. Her train trip in 1939 was actually a separation; her Communist parents seem to have been forced to give her up, and so she was travelling to Munich to be fostered out. Through her grief, she discovers and eventually embraces her new family, which consists of Rosa, her bad-tempered new mother who has a heart of gold below her angry red face, and Hans, her unbelievably kind, caring new father, who plays the accordion and bonds with Liesel over her nightmares. He's also the one who - crucially - finally teaches her how to read. Liesel also develops friendships with the neighbourhood kids, especially Rudy Steiner, the boy next door who insists that one day she will let him give her a kiss. As The Book Thief explores Liesel's life, it maintains an excellent balance between the mundane day-to-day and the terrible events of World War 2. The complexity of the situation is fully explored, and starkly depicted. Liesel's family were hard-up before the war started, and as the German economy suffers, their circumstances grow worse and worse. Liesel and Rudy don't just steal books, they occasionally get hungry enough to steal food as well. Despite their poverty, though, the family doesn't hesitate to hide a Jewish man in their basement when the opportunity arises. Max, the Jew, becomes a friend to Liesel, and even manages to make a book for her. She keeps him secret, even as she and Rudy have to take part in the Hitler Youth Program and Hans has to join the Nazi Party. Then come the parades of Jews, marched through the town by Nazi soldiers. Dachau is, after all, just down the road. Somehow, even with all this, The Book Thief still has a kind of youthfulness. Maybe it's the simple yet evocative language, maybe it's that Liesel, the focal point, is so young. A key aspect of her character is that she is honestly too young to understand why these terrible things keep happening to her. She grieves, she hates those responsible, yet she struggles to survive purely because she doesn't know how to do anything else. Janet Maslin at The New York Times mentioned 'Harry Potter and the Holocaust' in her review, and in a way, that's a strangely accurate parallel: The Book Thief - like Harry Potter - successfully marries loss on an extreme scale with an unsentimental kind of compassion. Human beings are capable of horrendous atrocity, but some of them resist, and at least Death is generous.